In life there’s always an opposite for everything. In the dictionary itself, we can find the antonyms for many different words. Without the help of a dictionary, everyone knows that rich is the opposite of poor, healthy is just the opposite of sick, happy to sad and so on. Each word can affect our thoughts and emotions to be positive or negative, depending on their respective meaning. Undeniably, most of us would rather look forward to the positives like being rich, healthy and happy. Naturally, no one wants to be poor, sick or sad and continually have more of those. That’s why the choice of words we use daily is very important in order for the law of attraction to respond to us meaningfully. Part of the process of deliberate creation is to rephrase what we say to the positive in order to train our mind to think in the positive. 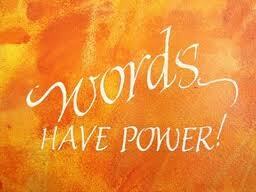 Positive words also provide the critical energy that inspires us to move forward. Do you think you are using the right words and phrases every day? Before we can take advantage of the law of attraction to improve our life, we must first and foremost identify what we want as well as those that we no longer need in our life. With clarity, we create a vacuum in our mind where we can implant inspired statements to achieve the list of wants we have identified. These inspired statements are what we call positive affirmations. A positive affirmation is a powerful tool that complements the law of attraction. It helps us to develop a positive attitude towards everything that’s happening in our life. The conscious use of positive words and reciting positive phrases is not something most of us are used to doing. Instead, most people have the tendency to fall back on negative words or statements as an instant reaction to things that do not go as desired. With this in mind, reciting affirmations is something that we have to do as often as possible. It takes a lot of practice. Reciting a positive affirmation will create a state of mind where we are constantly positive. Repeatedly done and once the habit kicks-in, our mind will continue on auto-mode in a positive state. This is when our journey on the road to tremendous long-term change begins. We all use the law of attraction irrespective whether we are aware or otherwise. It can be applied for anything, in any circumstances at anytime. As it is a universal law, anyone can use it too. It teaches us to focus on the end without worrying about the means of getting there. Using affirmations empower our thoughts to draw our focus towards the end results that we want. Positive affirmation does work because according to the law of attraction, whatever we focus on grows and we become what we think. Have you got your affirmations in order yet? It is advisable to create positive affirmations that are not too long as they are easier to be remembered. They can go along the lines like “I radiate love” or “I am healthy and happy” or “I have a wonderful partner and we’re happy.” Recite them several times a day, anytime and anywhere, while travelling in a bus or train, waiting in a queue, taking a walk or even possibly while we’re answering the call of nature. Desired results may sometimes appear quickly but in most cases, time and patience will be required. Getting the desired results will depend on several other factors such as our actions, faith and the feelings we invested while reciting our affirmations.